OMG! Tara I LOVE this! Love the colours (of course!!!) and you even gave her pink streaks!! LOL Absoloutly fabulous! And thank you SO much!!! Happy Birthday Cheri :) Hope it's a great one! I love the little embelly! Tara this is incredible and you even got her streaks in there! LOL, It is a perfect card. 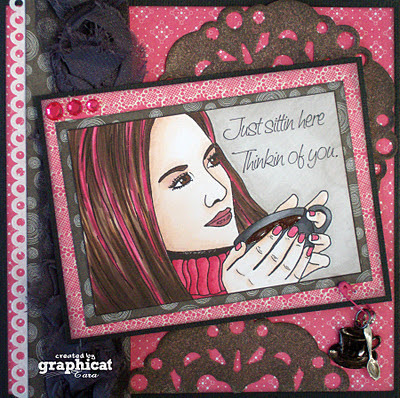 Gorgeous card, the pink streaked hair is just awesome! Wow! This is FABULOUS! Love your colouring and this style! Thank you so much for joining us at CLP!